Sarah-Beth Chester with some of her 7ate9 Bakery cheesecakes she created in a shared kitchen space in Winchester. WINCHESTER — Like an artist with a blank canvas, Sarah-Beth Chester is creating a masterpiece. Swaying side to side, like a mother rocking a baby to sleep, her slim body bends over her creations as she colors. Her cropped brown hair is wrapped tightly in a navy blue bandana. Her canvas: cheesecake. Colors on her edible palette: brown Taza chocolate shavings; red velvet crumbs; white towers of freshly made whipped cream, swirled into peaks resembling Christmas trees, smaller ones like stars. Her brush: a footlong, narrow silver spatula, this time spreading chocolate ganache. Two years ago, when Chester lost her financial services job, she decided to pursue her dream: crafting the perfect cheesecake. But first, Chester needed a kitchen. Unable to foot the expense as a start-up business, Chester searched for kitchen space to sublease that included an oven and a fridge. Close to giving up, Chester finally found not only space, but kindred souls in Steve and Danette Pazyra, owners of La Patisserie in Winchester. 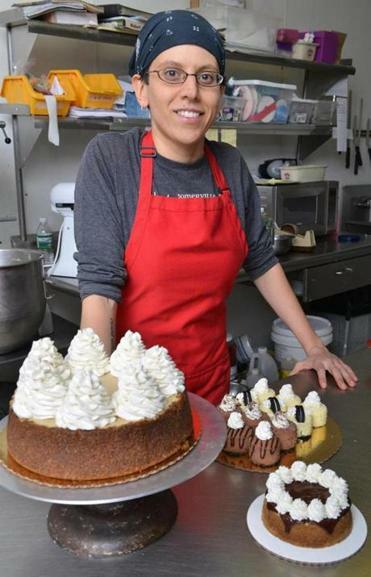 With a kitchen secured, Chester put a virtual store on her website, www.7ate9bakery.com (there are no walk-in sales), began delivering cheesecakes herself, and did her first farmers market in 2010 in Harvard Square. She survived her first year, and last year, business thrived. Black-and-white-striped awnings arch over two front doors at La Patisserie on Church Street, one the original front door when the bakery and café was only 400 square feet. It now spreads over 3,500 square feet. For 29 years, the Pazyras, who live in Revere, have been baking French and European cookies, breads, cakes, and pastries, all made from scratch. But no cheesecake. In them, Chester found fellow bakers who could relate not only to her dream, and the financial challenges that go with it, but the idea of shared kitchen space as well. That’s exactly how the Pazyras got their start three decades earlier. “When we started, we had no money,” Steve said. “The old Austrian man we bought the business from took his industrial mixer with him to New Hampshire, where he was starting another bakery. “So it’s come full circle,” Steve said. Chester’s cheesecakes come in three sizes — the mini, a 2-inch-diameter cake sold by the dozen for $25; the 4-inch family, offering four to six slices, which sells for $12 ($16 for chocolate); and the large, a 9-inch cake weighing 4 to 6 pounds and serving 16 to 20 ($46/$55). Various flavors and toppings are available at an extra price. For her popular red velvet cake ($16 for the family size), Chester also makes a party version that feeds up to 30 people ($57). Delivery costs an extra $5, but is free for orders over $75, in area towns including Burlington, Lexington, and Reading, “though most orders are where we do the farmers markets,” she said. Seasonal cheesecakes are her most popular flavors, such as the pumpkin for Thanksgiving. “We buy our pumpkins locally, from farms that do the farmers markets on the North Shore, Somerville, and Cambridge,” Chester said. Her puree is made from fresh pumpkins grown at Stasinos Farm in Peabody. Though initially she wasn’t interested in a chocolate version, Chester recently teamed with Taza Chocolate, a direct trade company in Somerville, to create “Taza Raza,” a classic cheesecake topped with a dark chocolate ganache, fresh raspberries, and fresh whipped cream. There’s also a mocha cheesecake, made with Taza chocolate and infused with espresso from Counter Culture Coffee. Chester, who worked full-tilt to handle the Valentine’s Day rush, participates every other Saturday in the Somerville Winter Farmers Market, held in the Armory on Highland Avenue. She brings cakes, takes orders, and delivers previous orders. Kathy Shiels Tully can be reached at kathyshielstully@ gmail.com.